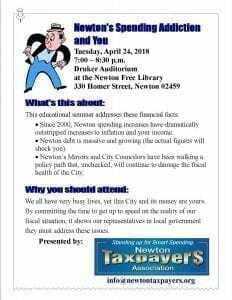 Nicely timed for just after tax day, and the announcement of Newton’s first $400M Budget, the Newton Taxpayers Association, is doing a presentation this Tuesday evening, April 24, at the Newton Free Library about our spending, debt and policies that affect our finances. As their flier notes, we all have very busy lives, which may explain why the earlier thread on the budget only has three comments — nobody’s had time to take a close look at it! (I’m guilty, too — getting ready for spring tree planting, not to mention finishing my own taxes.) But I’m very grateful the NTA exists and continues to take a critical look at the city’s finances. Personally, I am concerned that the current mayor’s plan to continue the policy of growth and higher density in residential units is inconsistent with the promise of careful financial stewardship. High density residential development in any community where schools are a draw will never bring in more in taxes than it costs in services, so profits for the developers come at a cost to current taxpayers. And MU4 developments that are overwhelmingly residential with a fig-leaf of commercial are not going to help, especially if they are replacing commercial-zoned properties. I’d like to see MU4 repealed as it’s being exploited by developers, but at the very least, there should be a moratorium on MU4 rezonings until 1) Zoning Redesign is completed, and 2) we’ve had a couple of years to gauge the real fiscal impact of Austin Street and Washington Place. The Mayor’s Summary section in the FY19 Budget, on page 15, notes that the NPS budget of $227.5 million plus an additional $29.7 million spent on the City side for school project debt service, pension and retiree health care for certain school employees, school health/nurse services, school crossing guards, school property insurance, and school building water and sewer charges, results in education accounting for 62% of General Fund expenditures. At the March 12 Finance Committee meeting, Planning Director Barney Heath enumerated the expected north side residential projects: 500 housing units at Crafts St/Whole Foods, 400 units in West Newton/The Barn, and 700 units at Riverside. Add to that something like 800 being proposed at the Northland site on Needham Street, and the already approved 68 at Austin Street, 140 at Washington Place, and 88 at Kesseler Woods, plus assorted condos in areas like River/Elm/Auburndale Ave in West Newton, that’s over 2,700 units. (Newton had about 31,000 housing units as of 2013.) So it’s hard to believe the projection on page 14 in the Mayor’s Summary that over the next five years, school enrollment will increase only 0.6%. And the cost of growth is more than schools. For example, we’re told Newton is one of the safest cities in the country. And that’s with the Police HQ we’ve got. Would we be hearing about the need for a new, larger HQ, with more parking, if we weren’t planning for a larger police force to serve a larger population? In addition to the Newton Taxpayers’ event on Tuesday, also scheduled this week are a series of FY19 department budget reviews by the Finance Committee, Zoning & Planning, Programs & Services, and Public Facilities. So if you’d like to know more about how the city is spending your taxes, this is a good week to pay attention. The new workforce like to walk for take public transportation to work. High density should try to attract highly educated indivuduals.. so unfortunately it means luxury units, this is just todays reality. Btw, the numbers for school enrollment don’t pass the sniff test. High density is fine as long as you show how the tax base is going to grow to support the services. Just introduce a high density tax… folks who want to pay a million dollars for a condo in newton will have to pay up..
Whatever happened to seeing students as an investment in our future? I’ve worked in low performing school districts – and there are a lot of smart kids not getting a good education who won’t be earning the big incomes to support our social security. We, also, are in great need of senior housing. Density walkable development supports local businesses. People who walk to shops visit more frequently and spend more per month than people who drive to shops. The Newton Taxpayers should be apoplectic about Newton losing out on the most valuable “community host agreements” associated with adult-use cannabis sales. There are other communities that have moved quickly to capture the best deals from growers and retailers. Most of these deals will exceed $1M per year to the host community. Some will amount to millions of dollars a year. The moratorium that was proposed by Fuller and passed by the City Council virtually assured that Newton will get pennies instead of dollars from cannabis companies that are spending their money now in more progressive municipalities. @Mike, I believe I Boston got their regs passed, but are we really so far behind nearby communities in timing that we would not attract cannabis businesses? Would they not want to be in Newton anyway, even if Waltham, Watertown, Needham, or whoever, got there first. I would think convenience would be a factor, just like it is for grocery shopping or buying gas. @Julia– You asked, “…are we really so far behind nearby communities in timing that we would not attract cannabis business?” I’ll answer your question first [YES], then explain and give you an example. A few of months ago there was an already state-licensed medical cannabis group that was interested in purchasing the NE Mobile Book Fair building on Needham St. Their intent was to preserve the building, use most of it for a processing center, and a smaller part for adult-use cannabis sales. They were willing to guarantee the City between $1M-$1.5M per year through a community host agreement. When the moratorium passed in Newton the group took their money [and approximately 75 jobs] to two other communities without moratoriums, where they are currently seeking final approvals.